•	The vaccine is available in dark bottles to protect from sunlight. •	Some bottles have a long neck as the vaccine is packed in vacuum. Just above the insertion of deltoid on the left arm to maintain uniformity and for helping surveyors in verifying the receipt of the vaccine. If the injection is too high, too anterior or posterior, the adjacent lymph nodes may get involved, inflamed, and tender. If not given at birth, give at 6 weeks along with routine vaccination at 6 weeks of age. •	Injection should remain intradermal. •	Do not use antiseptic before injection. •	If spirit has been applied, wait for it to completely dry off before injecting the vaccine. •	For 6 months, no injection should be given in the same arm in which BCG was given. What is the reason for giving BCG through strictly intradermal route? What if the dose goes deeper, e.g., subcutaneous? If BCG vaccine penetrates into the deeper tissue, it can cause local abscess and enlarged and painful axillary lymph nodes. There is a small chance of this infection getting disseminated too, if the cellular immunity of the recipient is low. Why do we give 0.05 mL dose of BCG to newborns (below 1 month of age)? This is because the skin of newborns is thin and an intradermal injection of 0.1 mL may break the skin and penetrate into the deeper tissue and this may cause local abscess and enlarged axillary lymph nodes. Danish 1331 is the WHO recommended strain of bacteria for the production of vaccine. Normal saline is the recommended diluent. The reconstituted vaccine may be used up to 3 hours and left over should be discarded. Why cannot we use distilled water as diluent when normal saline is not available? Distilled water is an irritant to the skin. As BCG is to be given intradermally, distilled water can cause irritation of the skin which may cause ulceration at the site of injection and in severe cases even sloughing of the skin. Approximately 15–20 years and the protection is partial protection. It is believed that BCG may offer only partial protection from TB but it seems to prevent severe form of childhood tuberculosis such as miliary tuberculosis and tubercular meningitis. •	Immediately after a satisfactory injection— wheal of 5 mm in diameter which later subsides. •	After 2–3 weeks—a papule develops which gradually grows in size till 4-8 mm. •	After 5 weeks—the papule subsides or breaks down into a shallow ulcer, usually covered with a crust. •	Within 6–12 weeks—healing occurs, leaving a permanent scar, 4–8 mm in diameter. •	Mantoux positivity develops usually after8weeksof injection. 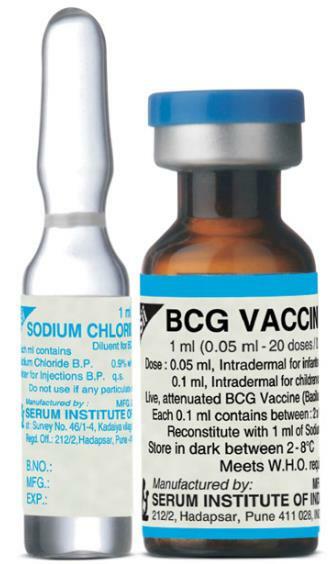 If no scar appears after administering BCG, should one re-vaccinate the child? There is no need to re-vaccinate the child even if there is no scar. Which type of immunity is mainly induced by giving BCG vaccine? 2. Park K. Principles of epidemiology and epidemiologic methods. In: Park's Textbook of Preventive and Social Medicine, 24th ed. Jabalpur, India: M/S Banarasidas Bhanot Publishers; 2009. 3. Park K. Epidemiology of communicable diseases. In: Park's Textbook of Preventive and Social Medicine, 24th ed. Jabalpur, India: M/S BanarasidasBhanot Publishers; 2009.